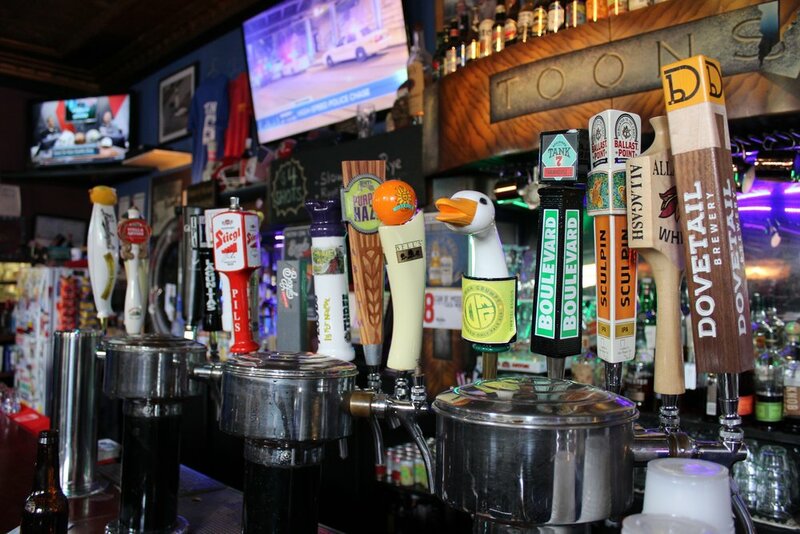 Chicago's friendliest neighborhood bar located steps from Wrigley Field on the Southport corridor. Some of the city's best bar food—from Black Angus Beef Burgers to House-Smoked Memphis-Style BBQ, World Famous Chicken Wings to New Orleans Po'Boys. Wraps, Sandwiches (try the Cubano! ), Hand-Cut French Fries, Homemade Soups & Chili, and of course, Daily Specials. Host to Crawfish Boils in the Spring, Chicago Cubs baseball in the Summer, and Kansas City Chiefs Football games in the Fall. Three Floyds Brewery—Please ask your server. This lager is unfiltered, golden, malty, rich, creamy, and complex, with aromas of malt & fresh hops. Unfiltered, unprocessed IPA made with Citra and Comet hops. Made with oats. This iconic ale features a blend of four hop varieties which creates a crisp bitterness and imparts massive floral and citrus aromas. Inspired use of hops creates hints of apricot, peach, mango and lemon flavors, but still packs a bit of a sting. Abita Hop-On is a full-bodied “juicy pale,” packed with Cascade, Citra and Ekuanot hops to deliver refreshing tropical and citrus notes. A creamy and refreshing wheat beer with some spicy complexity and light touch of passion fruit for a delicious and slightly exotic flavor. Generous portion of wheat and spiced with coriander and Curacao orange peel. Perfectly balanced with a malt backbone and combined with the signature fruity aromas of Bell’s house yeast, this beer is remarkably drinkable and well suited for adventures everywhere. A bit of Caramel Malt barley provides the richness that mellows out the twang of hops. A session IPA with a bright hop aroma and medium to low bitterness. A hoppy pale wheat ale that is great for IPA fans but so smooth that the hefeweizen fans dig it too. This smooth bodied oatmeal stout features aromas of roast and cocoa, and flavor notes of fudge, coffee, and caramel. Glossy and pale yellow, it is agreeably lively with a dry, thin body. Bell’s Oberon is a wheat ale fermented with Bell’s signature house ale yeast, mixing a spicy hop character with mildly fruity aromas. Rich and creamy. Distinctively black. Velvety in its finish. This iconic beer is defined by harmony. From this “land of beer” comes Stella Artois, the most acclaimed of Belgian beers. Honey-colored, immensely sessionable American pale ale with a pronounced, bright, American hop aroma and citrus flavor.